This German house has so many special features that it’s hard to know where to start. 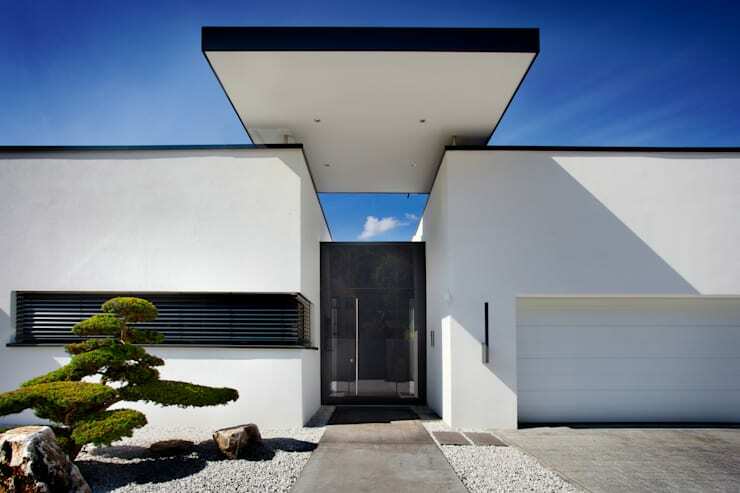 Clean-lined architecture that creates a spare modern exterior. An open-concept, eminently livable interior. Asian influences that add flair and style. Stunning landscaping that connects the house to its setting. And technology that makes this house energy efficient, safe and convenient for its residents. 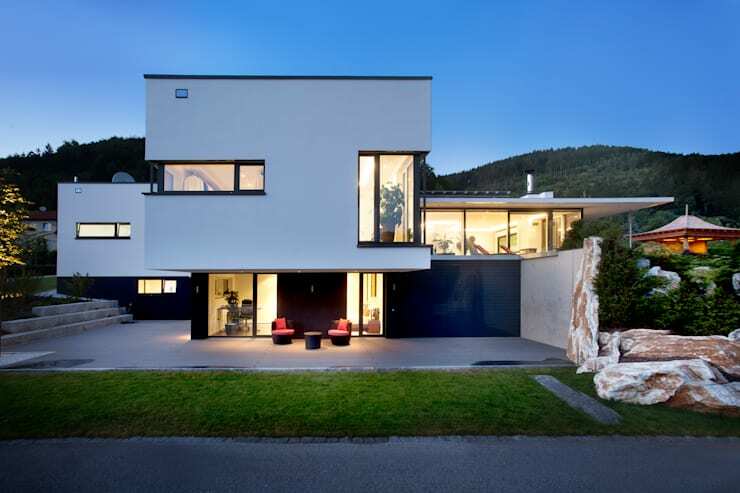 This house showcases what modern architecture and modern living is all about. The house is nestled into its sloping lot. At the top of the hill stands the boxy, clean lined structure. 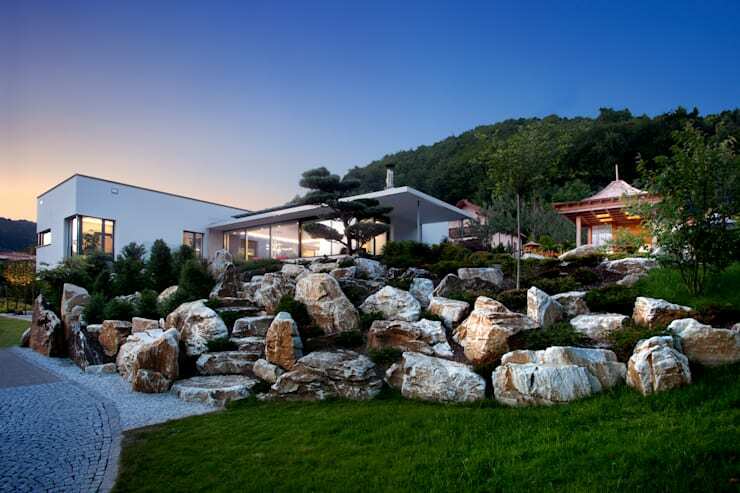 Large, sandstone blocks make for a rugged landscape that contrasts with the house’s smooth straight edges. 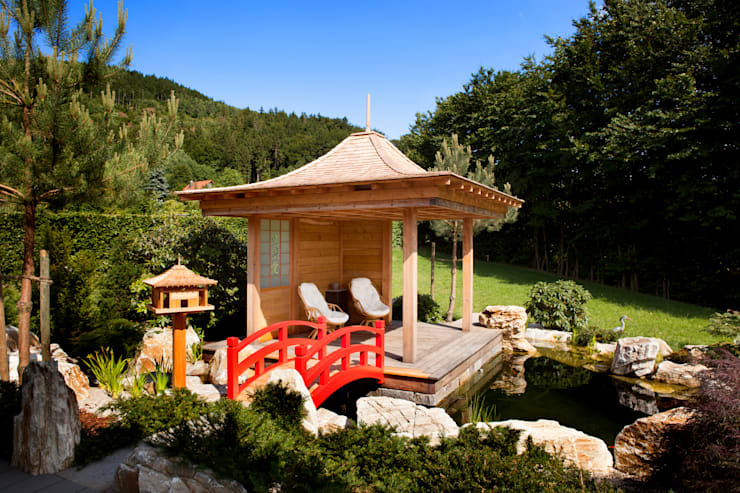 The bonsai tree and wood pagoda are obvious Asian references and add a whimsical flair to the exterior. While style was one consideration for this home, the environment was equally important. 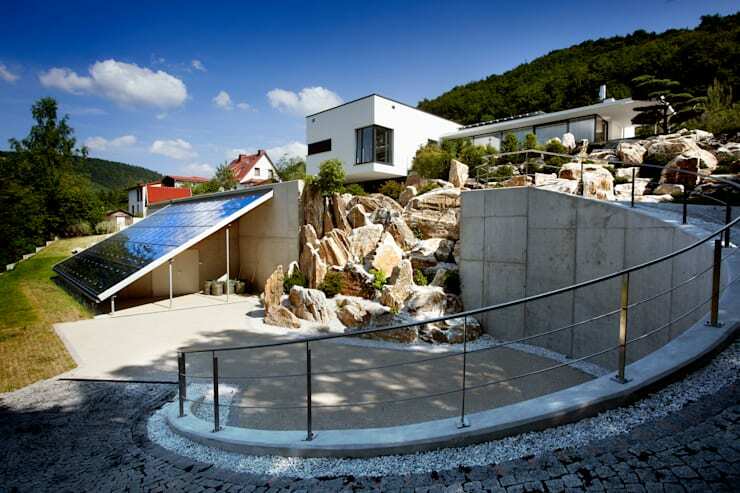 At the base of the slope, an array of solar panels provides all of the electricity for the home. 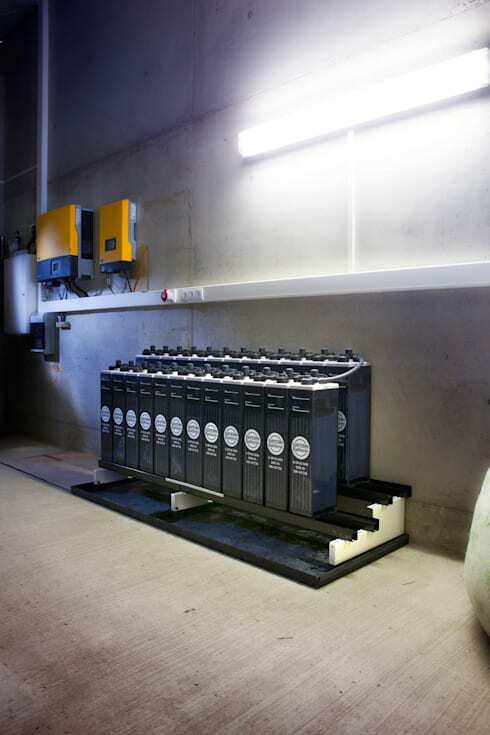 Any energy generated by the solar panels which cannot be immediately consumed by the house is stored in 24 high-performance batteries. Additionally, solar cells on the garage roof heat the house water as well as the water for the pool, koi pond and in-floor heating. Inside the house, this technology continues. 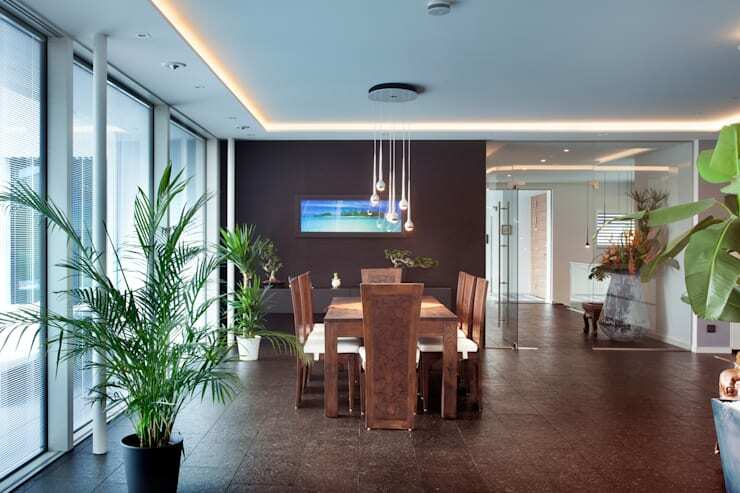 Touch panels allow occupants to access all of the systems within the house, from climate control and security to music and lighting. The system also tracks how much energy is being generated and consumed. With detailed data collection, homeowners can see and compare energy usage by day, month or even year. Residents can also access the system through their iPhones or iPads. And when leaving, everything in the house can be turned off with one touch on the panel at the front door. 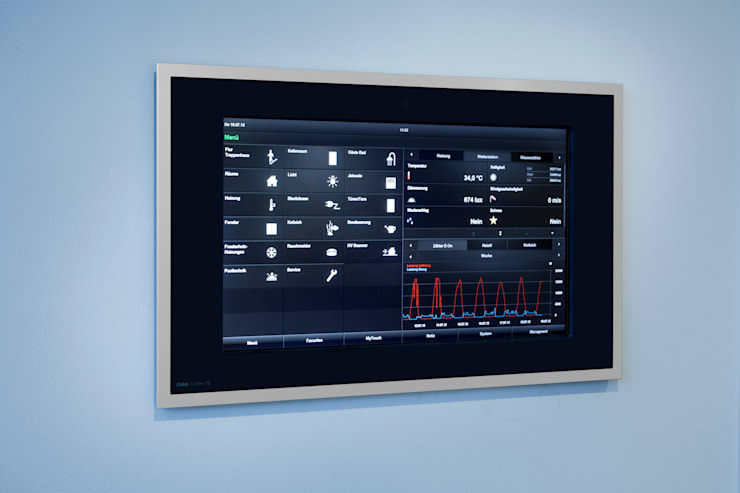 The Gira HomeServer is the brain, the control center that links all of the electronic components together. With all of this focus on technology, however, the designers did not skimp on style within the house. The kitchen sports the black and white palette established on the outside of the house. 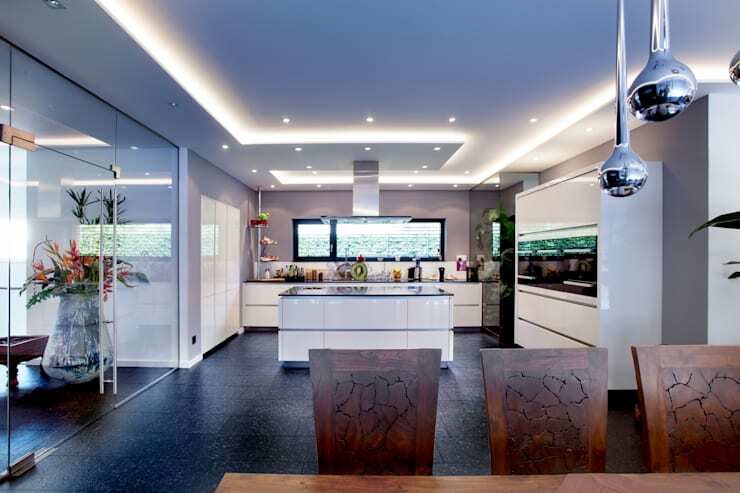 Glossy white cabinets with black appliances, window frame and countertops create a sleek, modern aesthetic. The designers eschewed fussy cabinet hardware in favour of smooth flat profiles on the cupboards and drawers. A mix of lighting styles—potlights in key areas throughout the kitchen, ambient glowing lights in the tray ceiling and a sparkling sculptural chandelier over the dining area—show the designer’s attention to every detail. In the dining room a chunky modern table is paired with sculptural wood chairs. A dark accent wall anchors the space. A floating credenza in the same colour as the wall provides storage and a spot to display a treasured vase and a pair of small meticulously pruned bonsai trees. The designers used a few techniques to unify the open-concept space. First continuing the same flooring throughout the home ensures there is a not a visual break to interrupt your view, so the whole space reads as one room. 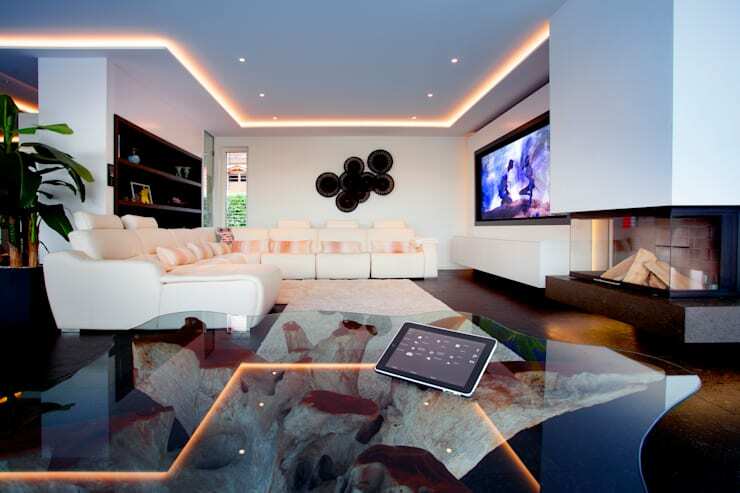 The subtle tray ceiling detail and perimeter lighting also create the feel of one large room. A wall of windows overlooking the stunning gardens floods the main floor with bright natural light. The living room is all about entertainment. A generous white sectional and modern glass fireplace encourage lounging. The large wall screen complete with hidden speakers gives a theatre-like experience to viewers. Of course, everything operates at the touch of a button. See more modern living rooms. The same style and attention to detail that we've seen so far throughout the house carries into the private spaces as well. 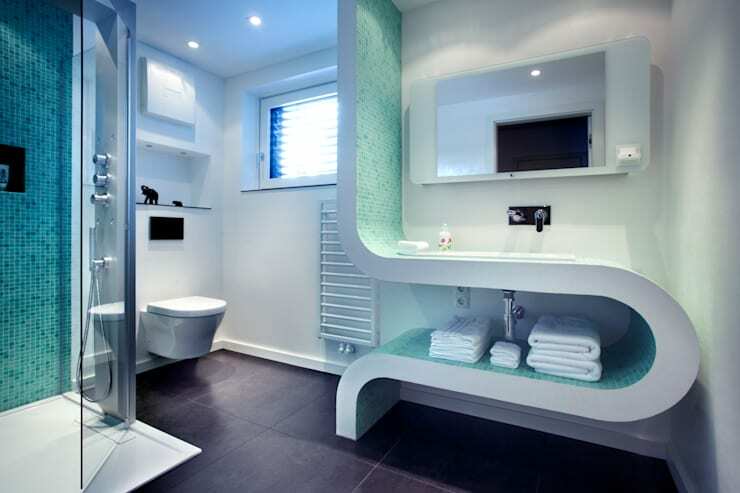 In this bathroom, the standout feature is definitely the sculptural curving vanity. Flowing from the ceiling, a sinuous line houses the sink as well as towel storage. A wall mounted tap does not interrupt the clean lines. Watery blue-green mosaic tiles in the glass enclosed shower and on the vanity are a perfect accent to the black and white colour scheme. This generous bathroom also employs sculptural fixtures in the freestanding tub and vessel sinks. This bathroom is the height of luxury with a sauna, generous glass shower and large soaker tub. At the same time, the space is environmentally sensitive. 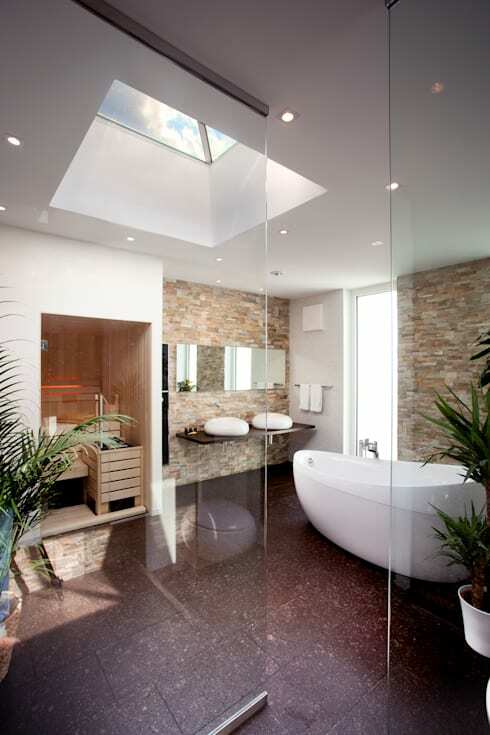 A skylight in the centre of the room offers abundant sunlight limiting the need for electrical lights. Large lush plants help to clean the air. Sensors measure the humidity levels and, if necessary, switch on the ventilation automatically. The stone walls reference the sandstone used in the landscaping outside. Outside was just as important for the designers as inside. Whether through the large windows or the surrounding decks and terraces, nearly every area of the home offers a view overlooking the home’s beautiful gardens. Off the living room, a large overhang provides a sheltered spot for dining. More sandstone boulders border the koi pond and a red-painted bridge leads to the garden’s main feature, the private pagoda. The pagoda, bird house and bridge—like much of the furniture inside the house—were made in Asia. These features are a distinct departure from the geometric rigor of the house. 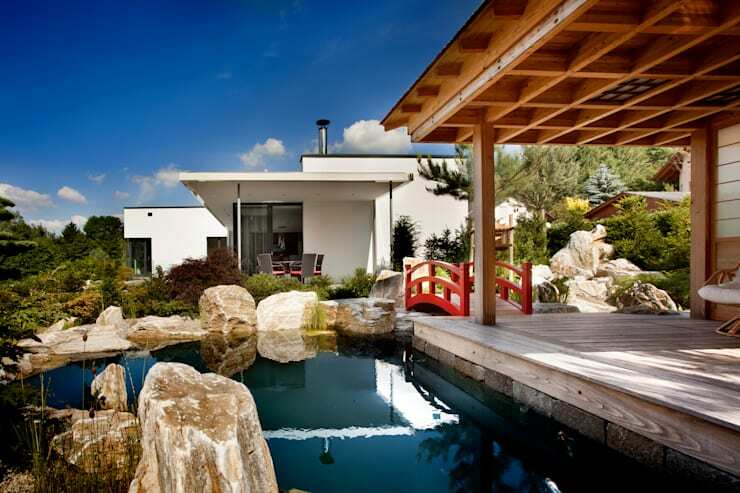 Their inclusion shows the homeowners’ love for Asian architecture and adds both charm and personality to the landscape. The koi pond is another technological highlight. 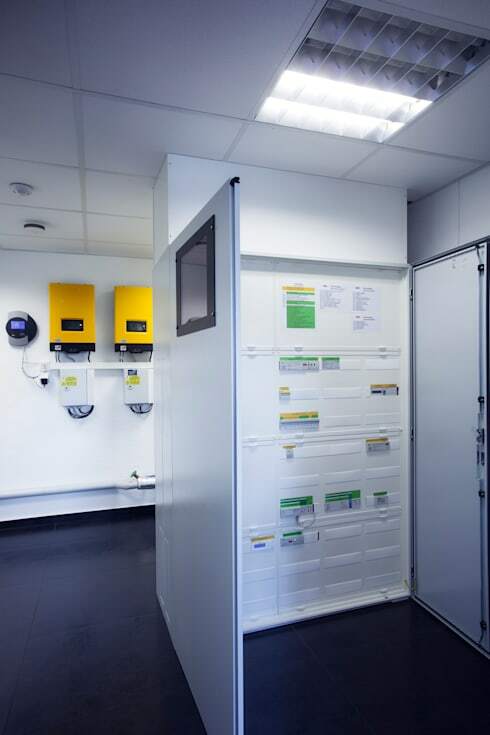 Temperature, water level and quality, lighting, pumps, filters, oxygen, sterilization, temperatures and much more are all monitored and adjusted automatically. The koi pond is not the only water feature on this stunning property. On the sundeck, we find a narrow lap pool. River pebbles purify the water naturally. They discharge acid, so chlorine is not needed. The pool, koi pond and garden irrigation system are all served by an environmentally friendly water collection system that gathers water from the roof, terraces and the property and drains it into a large cistern. The water collection system works even in winter thanks to heating in the walkways, driveway and flat roof that melts the snow and saves the homeowners from shoveling. Irrigation is controlled by iPad to ensure that the garden is watered only as needed. Modern has come to mean something very specific when it comes to home design: clean lines, geometric shapes, spare ornamentation. However, this home shows how modern extends to how we live, not just how our homes look. The integration of technology and environmental consciousness are important considerations in our modern lives and also in our homes.